Easter is a special time of year for most and it wouldn’t be a traditional Easter without freshly baked Hot Cross Buns. There is nothing like the smell of buns, fresh out of the oven. They taste amazing by themselves or even with a dollop of butter, jam, creme or Nutella. We’re not going to lie, they arn’t the best thing for the waistline however they are delicious and we have been eating well for the past few weeks so we can get involved. Nom Nom Nom! 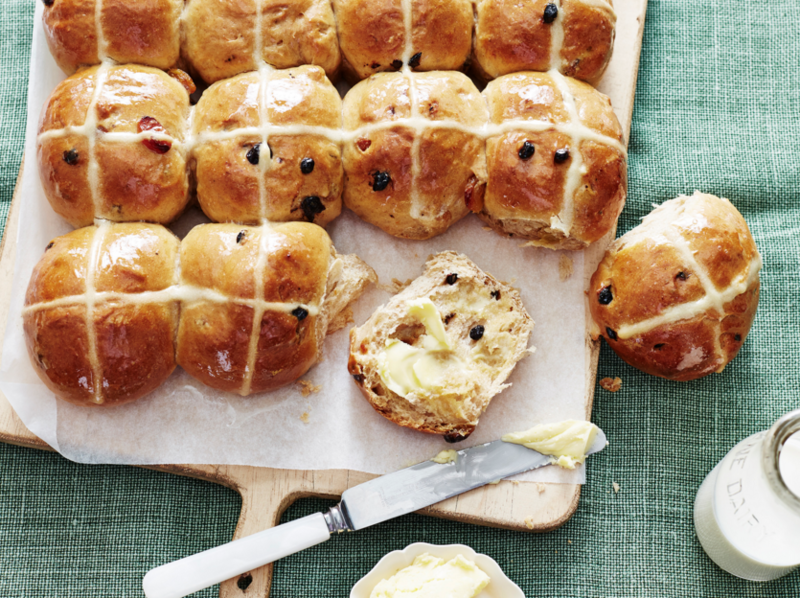 Bakers Delight will bake more than 13 million Hot Cross Buns this Easter!!! A hot cross bun is a spiced sweet bun made with currants or raisins, marked with a cross at the top and traditionally eaten on Good Friday in Britain, Australia, NZ, South Africa, Canada & India. The buns mark the end of Lent and different parts of the hot cross bun have a certain meaning, including the cross representing the crucifixion of Jesus and the spices inside signifying the spices used to embalm him at his burial. Here is a simple Hot Cross Bun Recipe if you want to try it at home. Make glaze: Place water and sugar into a small saucepan over low heat. Stir until sugar dissolves. Bring to theboil. Boil for 3-4 minutes. Brush warm glaze over warm hot cross buns. Serve warm or at room temperature. Happy Easter to you all – we hope you enjoy the long weekend with your families and friends.